The Citigroup Center (formerly Citicorp Center) is one of the ten tallest skyscrapers in New York City, United States, located at 53rd Street between Lexington Avenue and Third Avenue in midtown Manhattan. The 59-floor, 915-foot (279-m) building is one of the most distinctive and imposing in New York's skyline, with a 45° angled top and a unique stilt-style base. 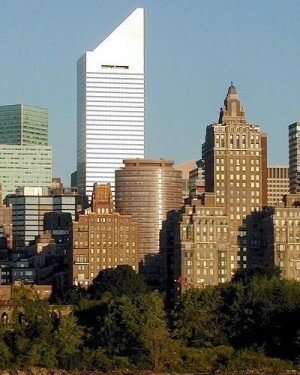 It contains 1.3 million square feet (120,000 m²) of office space, and the 45-degree angle at the top of the building was originally intended to contain solar panels to provide energy; this idea was eventually dropped because the positioning of the angled roof meant that the solar panels would not face the sun directly. It was designed by architect Hugh Stubbins Jr. for Citibank, and was completed in 1977. The building is currently owned by Boston Properties, and is the tallest building that bears the Citigroup name. The northwest corner of the site was originally occupied by St. Peter's Evangelical Lutheran Church which was founded in 1862. In 1905, the church moved to the location of 54th Street and Lexington Avenue. From the beginning, the Citigroup Center was an engineering challenge. Skyscrapers by Hugh Stubbins Jr.